JAKARTA, Indonesia (CNN) -- A few nights ago Yulinar (full name withheld), a 23-year-old insurance agent in Indonesia's capital city of Jakarta, was in bed doing her usual ritual before falling asleep: updating her Facebook status and checking her friends' updates. 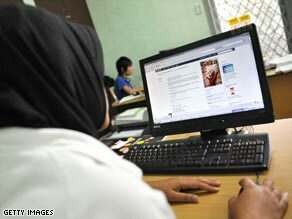 Facebook is booming in southeast Asia among 13-to-25 year olds, many of whom have multiple online identities. Facebook, the popular social networking site that's well established in developing countries like the U.S., where it started about five years ago, is now getting its fastest growth rates in developing countries. During a recent three-month period, Indonesia led the world in new Facebook users among countries with at least a million users, growing by about 120 percent, according to Ben Lorica, a San Francisco-based senior analyst in the research group at O'Reilly Media. Coming in at No. 2 was the Philippines. The appeal of social networking is pretty universal, but there can be some interesting cultural wrinkles among countries, too. For instance another 20-something office worker in Jakarta, Luna (real name withheld), created her first profile so that she could network with her nightlife friends. Pics from her nocturnal adventures are posted there. But then she created a second, tamer profile for connecting with co-workers and school friends, many of whom are more conservative Muslims and, unlike her, choose to wear headscarves and avoid nightlife. For instance: Elmo Yahya is the same person as Elmer Al-Kautsar. Luna, too, can spell her name in a variety of different but legitimate ways, and most friends would know to look up only the name variation she gave them. For Yulinar, who has only one profile and started using the service about six months ago, checking Facebook already seems like a normal part of life. Almost everybody she knows from school and work is using it now, she says. Indeed it's hard to avoid the Facebook logo here. Look at laptop screens in cafes and you'll likely spot Facebook pages. Billboards touting mobile phones or cellular plans display the logo prominently, assuring buyers they'll have access to what is now an essential service for many. Yulinar uses Facebook primarily for learning about her friends' holiday plans, relationship updates or favorite new restaurants. "It's fun," she says. During the working hours she uses Facebook from her cell phone and later at home from a laptop or iPod Touch over wi-fi. But less than 2 percent of Indonesia's vast population -- the world's fourth largest -- is using the service, says Lorica, leaving plenty of room for growth. He expects to continue to see Indonesia and the Philippines in leading positions in terms of new users. Friendster, a competing social networking site that gained early popularity in Southeast Asia, has seen Facebook eat into its market share. In Indonesia, Facebook is now the second-most popular site, after the local version of Google, according to Alexa.com. Friendster is sixth. Friendster still outranks Facebook in the Philippines, according to Alexa.com. But Facebook is coming on strong, says Lorica, who is originally from the Philippines. In terms of mind share, he says, "it seems like Facebook is what people are really talking about." Yulinar used Friendster previously, she says, but not anymore. "Many people changed to Facebook." The fact she and all her friends switched so easily from one service to another might pose a long-term challenge for Facebook. Indeed, despite all the time she's sunk into using the service, she believes that Indonesians like herself are prone to following fads and that Facebook, in the end, might prove to be one too.